UPDATE: Over now folks, will announce the winners in the a.m.! This week I’ve got another round of my popular Mystery Envelopes. 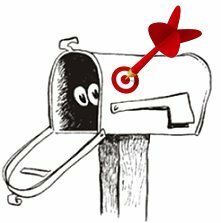 🙂 For those of you unfamiliar with what a mystery envelope is here on Totally Target- it’s basically an envelope just full of great stuff that us thrifty folk consider valuable treasure… COUPONS! There are lots of great coupons inside each one, and there is a nice mix of Target Store coupons and manufacturer’s coupons. I try hard to keep the majority of them non-mainstream coupons, or very regional insert coupons. I think that it makes them super fun for the winners to open! I have several wonderful and generous readers across the country who continually help me to fatten these envies too, so it is a pretty great mix of some nice coupons! A big Thanks to MaryBeth, Karen, Vanessa, Heather C. and to Cammy of Super Saver Coupon Book for Houston. Your generosity & willingness to share is truly appreciated. I love mystery envelopes. Thanks for another great giveaway! Mail is so much fun!! I’d love to win this! Thanks for the giveaway! Thanks for the give away, today is my birthday maybe I’ll win!!! I like mysterys and would love to see what it is!! Thanks for the chance! I would love to know what mystery coupons were in the envelopes. Hope I win, I love paper goodies!!! Would love to win the mystery coupons. Love surprises! I hope its me! Sounds fun! Thanks for the chance to win! PIck me! Pick me! I would love to win!! Pick Me! I love a Good Mystery! This would be wonderful! Thanks so much! So excited!!! It would be nice!! Awesome idea for a giveaway!! Oh yea hoping for a mystery envelope! Would love to have the Mystery Envelope,thanks so much! Ooh pick me! Pick me! This would be fun. Thanks. Yay, this is awesome. Hope I win, thanks. I would love to find out what’s inside! Thanks for the giveaway! I would love to win this. Thursdays have to be one of my fave nights! Giveaway night! Love the mystery envelope giveaway!